We are frequently asked the following questions regarding glaucoma in animals. The answers are intended as general responses to increase your understanding. Please feel free to ask any additional questions you may have. If you ask any ophthalmologist to list the most frustrating problem that we face, invariably the answer will be glaucoma. It is the leading cause of blindness in dogs but is a nemesis in any species in which it presents. The frustrations stem not just from our frustrations at eliminating patient (and owner) suffering but also from the different causes and ways it may present, the potential for insidious onset and inexorable progression despite our best efforts, the number of ocular diseases and surgeries in which it may be a secondary complication, the time and economic commitment required for glaucoma monitoring, the myriads of treatments without one primary treatment that is uniformly successful, and the horrendous expense of medications, surgeries, and just lost time in man hours for both the owner and the practitioner. It is even frustrating for us to stand before you talking about the same disease year in and year out. However, we do have some new discoveries, new medicines, and new surgical techniques upon which we can rely. In the brief time we have with you today, I hope to bring you up to date on our newest discoveries and advances with the hope that we can through early detection and treatment prolong vision in affected animals. In general, no! In fact most animals should live their entire lives without developing cataracts. The lens does become thicker with age and thus appears grayer causing many people to mistake this change for a cataract. This normal aging process is called nuclear or lenticular sclerosis and does not impair vision other than making focusing on close objects more difficult. However some animals do develop cataracts and certain breeds of animals are afflicted with hereditary cataracts so that a significant percentage of the population may develop cataracts. This is especially true in dogs. Miniature schnauzers, cocker spaniels, poodles, Labrador retrievers and golden retrievers are just a few of the breeds which may be affected. 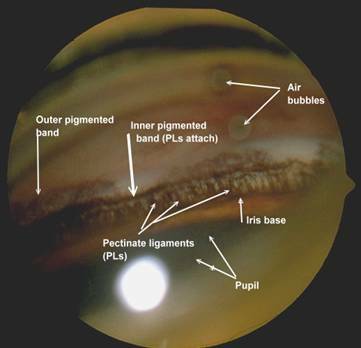 Figure 1: Normal canine iridocorneal angle with well-differentiated pectinate ligament. Figure 2: Normal feline iridocorneal angle. Note the very wide space between the iris base and where the pectinate ligament attaches to the cornea. Figure 3: A very narrow angle in cocker spaniel. The intraocular pressure in this eye was normal, but the fellow eye had markedly elevated intraocular pressure. 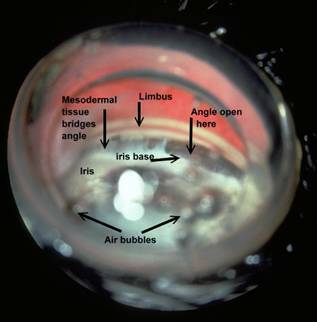 Figure 4: This is the iridocorneal angle of an Australian shepherd with mesodermal goniodysgenesis in which the pectinate ligament did not differentiate completely resulting in areas where a broad membrane bridges the iridocorneal angle. While the IOP was normal in this eye, it was elevated in the fellow eye where hyphema was present after the dog was kicked in the head by a horse. 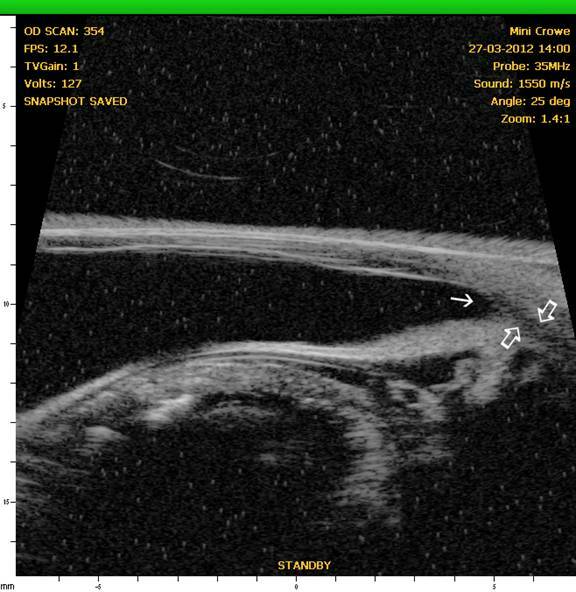 In recent years, through the use of high-resolution ultrasound (HRUS), we have been able to image the ciliary cleft where aqueous passes after it moves through the iridocorneal angle, and the results have revealed another factor that can contribute to increased intraocular pressure whether the iridocorneal angle is normal or not. In the following figures, note the differences in the ciliary cleft between the right and left eyes of a 10 year-old spayed female Boston terrier. The dog presented for cataracts and had a mature cataract in the right eye and an early immature in the left eye. 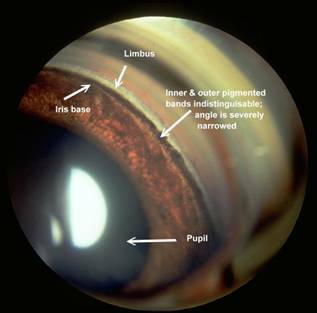 At the initial examination gonioscopy revealed the iridocorneal angles were normal in both eyes. An electroretinogram was scheduled to evaluate retinal function (since the retina in OD could not be visualized) and prior to dark adaption the pupils were dilated with 1% tropicamide (a short acting anti-cholinergic mydriatic). 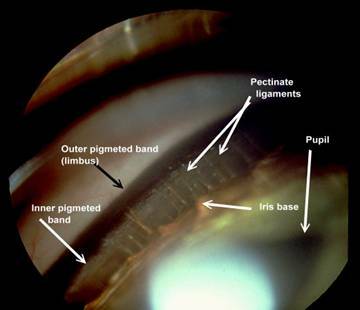 The intraocular pressures (IOPs) were measured prior to and following dilation of the pupils. Prior to and following dilation the IOP in OD was 18 mmHg whereas the IOP in the left eye was 21 mmHg prior to dilation and 26 mmHg following dilation. HRUS revealed a normal ciliary cleft in the right eye with the mature cataract) and a markedly narrow ciliary cleft in the left eye with the immature cataract (See Figures 5 and 6.). Such occurrences illustrate the potential for problems with dilation of affected eyes as well as for an increased susceptibility for complications following cataract surgery. Figure 5: OD – HRUS of the anterior segment of the right eye revealing a normal iridocorneal angle (solid angle) and ciliary cleft (open arrows). Figure 6: OS – Note the normal iridocorneal angle (solid arrow) but narrow to nonexistent ciliary cleft (open arrows) accounting for the reason for the increased IOP in this eye after dilation. The prevention of glaucoma centers on the recognition and, when possible, elimination of the risk factors. With secondary glaucoma this would center on the early detection and control if inflammation and secondary scarring. This may be easier said than done, but it is much more likely than eliminating the anatomic and genetic factors at play with primary glaucoma. In the latter, the best we may achieve may be to delay the onset of the elevated intraocular pressure as long as possible. 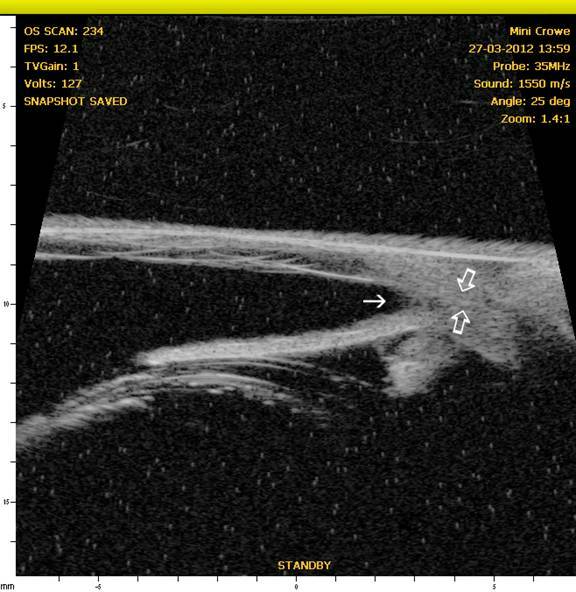 The application of twice-daily topical 0.5% timolol with 0.1% dexamethasone or the use of 0.125% demecarium bromide once or twice daily with the 0.1% dexamethasone have been shown to delay the onset of angle closure glaucoma and may be administered to the eye with normal intraocular pressure. The exact mechanism remains to be fully elucidated, but prevention of inflammation and increasing facility of outflow are thought to be key factors. Some ophthalmologists favor immediately starting topical prostaglandin F2-alpha analogues or carbonic anhydrase inhibitors in the normal eye, but such action would eliminate the potential for gradually increasing medications as pressure rises or for countering an acute glaucoma attack while vision is preserved long enough to allow surgical intervention. Brinzolamide (AzoptÒ) 1% ophth. soln. : 1 drop t.i.d. Increase iridal, eyelid and eyelash pigmentation in man and primates. Use with caution in uveitis & lens luxation – potent miotics. While Mannitol (0.5-2 g/kg slow IV) is classically recognized, it is cumbersome to administer and not without significant risk of systemic side effects. Further it must be administered in the hospital. Oral U.S.P. pure glycerin is administered orally at 1/3 cc/lb with equal volume of water, milk, or melted ice cream. After dosing, withhold water for 1.5 hrs. May be repeated q. 8 h. and may be kept at home by the owner for emergency use in acute glaucoma. Diode laser cyclophotocoagulation is perhaps the most successful long term surgery and is usually performed using an endoprobe to allow visualization and ablation of individual ciliary processes. It is usually performed with or without lens extraction, and an Ahmed valve or other shunt may be implanted prior to performing this procedure to allow a means of ameliorating postoperative pressure spikes associated with inflammation from the procedure. Alternatively repeated anterior chamber paracentesis may be performed postoperatively but that may need to be done several times per day for 2-4 days. Trans-scleral cyclophotocoagulation preceded this method but causes so much inflammation that shunts were/are usually tried first. Shunts are indicated to provide immediate lowering of IOP with less potential for postoperative inflammation. Repeated procedures may be needed and costs are significant. Enucleation, intraocular prosthesis, or intravitreal injections of gentamicin should be considered in cases where vision is irreversibly lost. These procedures along with their pros and cons will be discussed in lecture.